Jorge Ameer is, in my opinion, one of the most underrated directors working in gay cinema and I suspect that the reason for that is that he makes us think. His movies are always entertaining but they also have something extra that causes us to evaluate what we have seen. 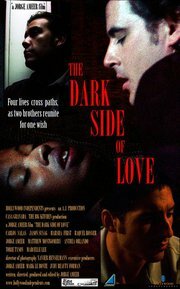 His new film, “The Dark Side of Love” takes a look at identity and destiny as if affects four people whose lives come together as they search for who they are and where they are going. Steven (Harsha First)) is our guide here and he takes us by the hand early on and leads us into the film. With the theme of the universality of love, we are shown the four characters who must make decisions that will affect their lives. Two brothers; Julian (Carlos Sales), a waiter and gay, Michael (Jason Susag), an abusive drug addict fight to gain control of their lives which seem to be going in the wrong direction. Julian develops a crush on a bachelor (who he meets in a very clever way) while the other brother, because of his drug habit and his feelings about his gay brother, has lost touch with reality and has trouble controlling his life. The brothers have been estranged but they are forced to come together with the death of their mother so that they can plan her funeral—a taxing situation, to say the least. Since they do not get along, their “relationship” tests both of them. It is so very difficult to prepare for the death of a parent and even though everything may well be worked out ahead of time, the actual death is not just heartbreaking but trying. Regardless of how they feel about each other, they are brothers and even when tempers flare up and emotions get very high, they know that this is the time to say goodbye to the woman who gave them life. Each brother is forced to look within himself and deal with his feelings, his anger and range and his prejudices. Steven, our bachelor is looking for a wife and he is not really in the picture like the brothers but his role becomes very important later. When Julian goes home to prepare for the funeral, Steve surprisingly appears at his home with the excuse that Julian should not have to face the ordeal alone. What is so interesting here is that Steven maintains that he is straight and the he and Julian actually only met several days before. There is another character, Chanel (Raquel Rossner), Michael’s girlfriend who comes along with Michael when he goes home to bury his mother. As the brothers prepare to say goodbye to their mother, old wounds are reopened and they are forced to deal with the fact that what was once a family is no more. The death of the mother is the pivot around which the film revolves. As we enter the world of Julian, Michael, Steven and Chanel, we find that each is searching for identity and we are part of that quest. This is a dark film as the name suggests and the beginning is quite shocking. The cinematography goes right along with the theme of darkness and there are few scenes with bright light. Some might find this depressing but I actually found it interesting especially when we see light at the end. Ameer not only directs but he also wrote the screenplay and produced and actually appears in a small role. I must say that it took me a bit to get into the film but I soon found myself glued to the screen as I watched and I wanted to know how everything would turn out. The actors give fine performances and I found myself at one point thinking about the meaningfulness of life. When Julian goes to the funeral home (before he is aware of the details his mother has left for her sons) to pick out a coffin, I found myself thinking that after having lived on earth for a lifetime, we are relegated to spend eternity in a box somewhere beneath the earth and that bothers me. I do not know why I never thought about it before and I find it very interesting that it was Ameer’s film that brought that home. We are all just passing through and when it is over, it is over. This entry was posted in GLBT Film on February 8, 2012 by Amos.